Oops. The final Right to Buy stats before the election show that the reinvigorated policy is delivering less than half the new homes the government previously claimed: one for every 11 sold. 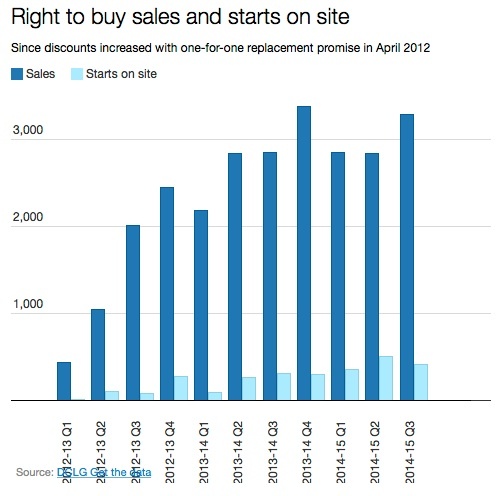 Up to now, the ratio was running at one start on site for every five homes sold compared to an apparent pledge of 1-for-1 replacement when discounts were increased in April 2012. The chances of achieving that always seemed somewhere between slim and zero given that the Treasury still takes a cut of the receipts and the fine print meant that the pledge only applied only to additional sales on top of those already expected, even though the replacements would not be like for like. However, as Pete Apps reports, today’s figures for replacement starts on site have been revised downwards substantially. The apparent 4,795 starts between April 2012 and September 2013 turn out to be just 2,298. That compares with more than 26,000 homes sold off since April 2012. Pete reports that it is understood that the revision follows an anomaly pointed out by CIH and is related to ‘a substantial revision of figures by 68 local authorities’. ‘These figures form a proxy for the number of replacement homes delivered using RTB receipts. In some cases they may include some starts on site or acquisitions that are funded by other sources. Provision was made for some local authorities to include Homes and Communities Agency (HCA) or Greater London Authority (GLA) spending for starts on site or acquisitions, where business decisions had already been made in 2012/13, before the Department clarified that these should be excluded. These starts on site and acquisitions are currently not included in the statistics provided here so that the statistics are based on a consistent definition over time. ‘This quarter, a full review of all data on starts on site and acquisitions provided by local authorities was conducted, with 165 local authorities (all local authorities who have signed an agreement to retain RTB receipts) contacted and asked to confirm that the delivery they reported had not received HCA or GLA funding. Responses were received from 143 local authorities. Of those who did not respond 13 had previously reported no starts on site or acquisitions, while the remaining 9 had previously reported 35 or fewer starts on site or acquisitions. ‘As a result of this review, the statistics on replacement starts on site and acquisitions contained in this release represent a substantial decrease from what was published last quarter, with 68 local authorities revising their figures. Local authorities who revised their figures and local authorities who did not respond to the review are indicated. Note that the revision could well be higher given that 22 local authorities did not respond to the DCLG’s request for information. You would of course guess none of this from the press release issued by Brandon Lewis today boasting of ‘33.000 new homeowners thanks to the Right to Buy’. Today’s revision strips away any pretence that the new Right to Buy is much different to the old one. It makes calls this week by the CIH and Rural Housing Policy Review Group for Right to Buy exemptions for rural communities look very well timed. With the election only 10 weeks away, it also means that the Conservatives will have to be even more shameless to go ahead with a manifesto pledge to extend the Right to Buy to housing association tenants or even give away social housing completely. But perhaps not so shameless as Cameron and Shapps when they made that 1-for-1 pledge.